Strapped Belts is an amazing and creative company founded by artist John Frechette in Jackson Hole, Wyoming. He took a class in which he worked with glass and found his passion. Then, "in 2008 as a result of life's twists and turns. After his employer went bankrupt, he was "Strapped". Strapped for cash and strapped for a job." So, he started creating artistic belt buckles. He didn't stop there. He then made earrings, cufflinks, necklaces, pendants, rings and even housewares! That's right, John has created a whole line of incredible handmade wearable art. The color is actually a little more turquoise and less green than it appears in this picture. I tried taking pictures of it under a light, on different surfaces, at different angles, etc and my camera could not seem to capture the true beauty of this buckle. The turquoise is glittery and has little swirls in it. Then, there are black and white flecks and white lines on top of the turquoise background. This buckle is beautiful! It is also really well made. The glass is well sealed and thick, but not heavy. The buckle then has a metal attachment on the back. The belt itself is also well made. It is genuine bonded leather and the perfect thickness. Strapped Belts also recently worked with 3 Olympic Athletes on promoting their products. Go to the Strapped blog for photos and details. I also want to thank Business 2 Blogger for bringing me together with Strapped Belts! 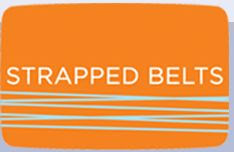 @Latsyrc728 & @strappedbelts have a $62 Strapped Belts #Giveaway : http://goo.gl/fb/C079 #contest Please RT!! Giveaway ends 3/22/10 at 9pm EST. Giveaway is for US and Canada residents only. Winner will be chosen randomly. Winner will be contacted via e-mail and then will have 48 hours to respond before a new winner will be chosen. Disclaimer: I received a belt and buckle to do this review. I was not compensated in any other way and the views posted are my own honest opinions. All pictures here are property of Strapped Belts except for the second picture which was taken by me. I love the cow belt buckle, but I am head over heels for some of the earrings. The blue ones you have above are great and the green ones on the site are gorgeous. I went to the site. I think the orange flower buckle is the one for me! Im now following you. This is a great giveaway! So many cool things! I think the Dog Buckle is my favorite, but it's hard to decide! I follow the Strapped blog with Google Friend Connect. I follow Strapped Belts on Twitter (@thxmailcarrier). I entered your Supermarket Smarty giveaway. Ahem... I am entering. Though I am a B2B and I have StrappedBelts as well... I love them. I'll enter here, and when I put up my giveaway, you can enter mine. Fair? Cyan Blue with Three Flowers Buckle is my favorite... for now, but it is sooo hard to choose! I got an orange and white one. I LOVE it! I really like the Blue River Buckle!!! I would choose the Green Belt Buckle with Yellow Heart and a Black Strap. I like the Black Glass Dot Buckle with a Black Strap, thanks. I love the blue river buckle. Thanks for the chance. i would love to have the red and black checkered belt buckle! 1 - I subscribe to your newsletter. 2 - I subscribe to your newsletter. 3 - I subscribe to your newsletter. I like the dog buckle! I like the kelly green earrings. I would love the Red Ring with White Lines. I'm a Facebook Fan of Thrifty and Frugal Living. OMG@ Whay too cute stuff!!! I like the Solid Red Glass Belt Buckle. My teen daughter is BIG into belts. I think she would love the white buckle with multi colored strings. The best part would be that her friends would all want to know where she got it!! I would love to have the Black Glass Dot Buckle. I like the Charcoal Gray Earrings with White Lines. Thanks for the contest. I love the Mint Glass Ring, thanks! It was hard to make a choice from so many gorgeous buckles. I think my favorite is the Diagonal Stripe Belt Buckle w/ Three Shades of Blue. I would love to get the Pale Purple Glass Ring! I love the Spring Green heart buckle! I would love to have the Mint Glass Ring. I love the Amber Plate with White Stripe! I became Strapped Belt's fan on Facebook under the name Lily Kwan/likwan.